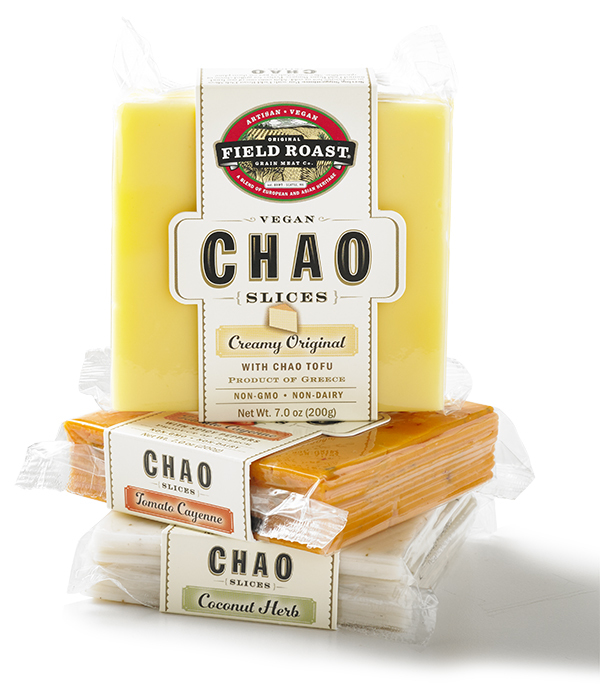 Discover the tastiest vegan cheeses in our cheesey taste test! 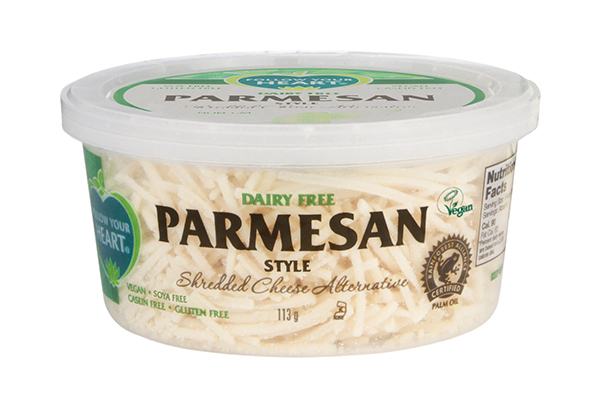 One of the most difficult things for new vegans is finding a substitute for cheddar, blue cheese, mozzarella or parmesan. For years many vegans simply had to do without, and many just didn’t want to embrace ‘fake cheeses’ made from plant-based products. But there is a growth in vegan cheeses, and we taste tested a few to find out just which ones hit the spot! If you are looking for a smoky pot of goodness to tickle your taste buds, then this is the one for you! With its distinct paprika flavour, this creamed chease is the perfect spread on a bagel. So much so that no other pickle or chutney would be needed to complement it. It has a beautiful rounded flavour and would be perfect in a crusty bread sandwich, loaded with simple salad leaves. No other spread would be required, you could slather this chease on both slices, then tuck in to a tasty lunch! It is also very smooth, so spreads easily, in fact we ended up just eating it off the teaspoon! If you were finding the ‘traditional’ cheese transition difficult, then this alternative will banish any doubts. 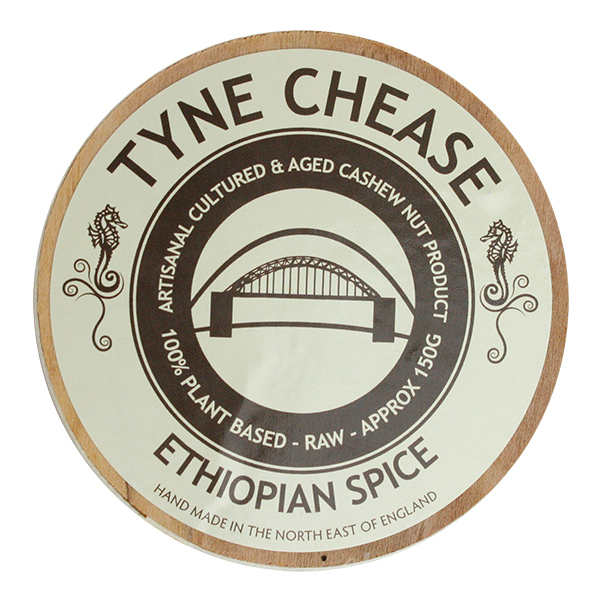 Tyne Chease also do a garlic creamed chease and an Ethiopian spiced product. It keeps for four weeks in the fridge or three months in the freezer – but we reckon it’ll all be eaten long before that! This chease had our deputy editor Lizi’s name on it for testing, as she’s definitely a spice kind of girl! It was created by the founder of Tyne Chease, who was inspired by her childhood memories of growing up in Ethiopia. It has exotic and warming notes, which comes from the unique blend of spices. These include cumin, coriander, fenugreek, pepper, ginger, thyme, cloves, nutmeg, cayenne pepper and allspice. One of the perfect things about this mixture is that there are at least three spices in there that Lizi isn’t keen on, but blended altogether, she thought the flavour was fantastic. The spices are lightly scattered on the cheese, so when you put your knife in they scatter through the creamy chease and naturally mix well. The chease itself is delicious. It’s creamy, soft and could easily be eaten on its own or spread on a fresh, crusty roll. If you wanted to have a chutney we would suggest a soft fig and onion jam, without any extra chilli! 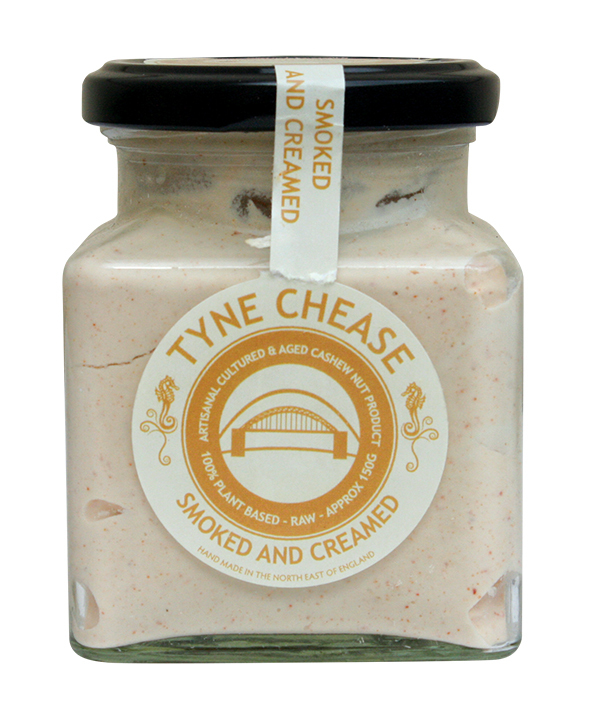 This is a fantastic chease, we can’t recommend it highly enough. We love the texture of this tasty feta, it’s more like a soft cream cheese, with a really tasty, fresh-tasting blend of herbs that would taste amazing when spread on a bagel. 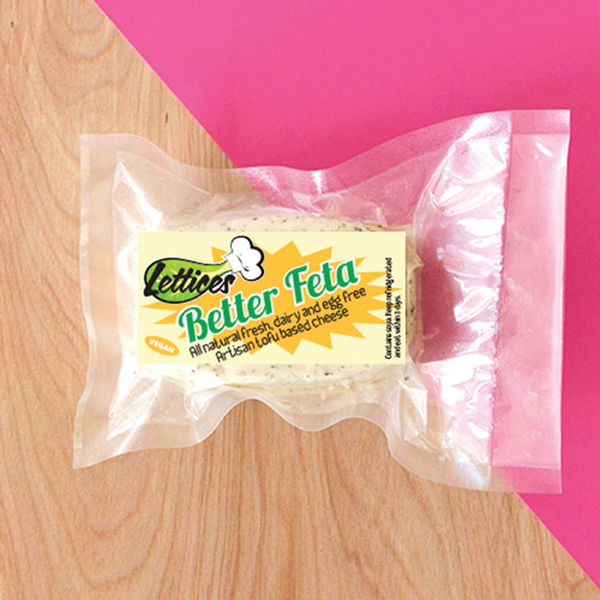 One of the good things about this feta is that a little bit goes a long way. Again, this is an advantage when it comes to using it for all the family. It definitely has a subtle tofu tang about it with a sesame hint, which isn’t disappointing. It also has an overture of chives, and consequently it would be lovely cubed and tossed in a fresh green salad, which would also offset the slight saltiness created by the sesame seeds. For those who have a penchant for hummus, this product has also got a hint of tahini. So, as it spread quite easily, it would be delicious on celery sticks for a refreshing snack. It’s a tasty cheese in its own right, there is no doubt about that! Price 200g pack (10 slices) $7.69. In terms of texture, smell and taste, this cheese is really similar to traditional dairy cheese squares. We think it would melt well, too. It has a buttery flavour, which is excellent, as it feels more like a ‘real’ cheese. This makes it easier to give to all the family. We couldn’t really tell the difference, it was similar to a really light, soft Cheddar. You could taste the flavour immediately and it also had a pleasant, slightly coconut aftertaste. Another good point is that is comes in slices. This makes it perfect for sandwiches, whether it be for work or school lunch boxes, or for picnics and days out. As well as tasting delicious on it’s own, it would go well with a range of different chutneys, including a chilli jam. This cheese is a real keeper! It also comes in tomato cayenne flavour, plus a coconut herb. We were amazed at just how like traditional Parmesan this is in terms of taste, smell and texture. You could easily serve this with a nice bowl of spaghetti to non-vegans, and they’d be none the wiser! It’s perfectly salty, and has a lovely deep, cheese flavour. Like ‘traditional’ Parmesan it’s slightly tangy, but still maintains a lovely rich, rounded flavour. As well as scoring high on the flavour side of things, it also has a lovely texture. In fact, it’s more like a freshly grated Parmesan cheese, rather than a tub of dried. Usually, dried and grated Parmesan is like old sawdust and isn’t fit for any dinner plate! Not so with this product. It tastes good AND looks good, so it would be a welcome finishing touch to any dish. We certainly wouldn’t restrict it to pasta dishes – it would be lovely tossed through a fresh tomato and green salad, just to add that extra flavour, without any extra effort! 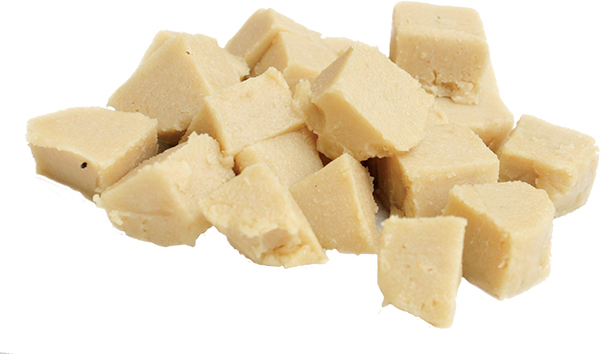 This cheese almost has the appearance of a soft fudge, but that is where the similarity ends. It cuts and spreads easily, yet it still has a lovely rustic texture, which would appeal to adults and children alike. It has quite a distinctive flavour, not so much of cashew, so don’t let the name of the cheese put you off if you’re not a fan of cashew nuts. The flavour leans more towards garlic than anything else. Again, even if you don’t like garlic that much, don’t worry, it’s soft and certainly not overpowering. We found it really went well with fruit, especially ripe, fresh plums. It isn’t too salty either, so it would go well on crackers or even in a sandwich with a fruity chutney. We also think it would be tasty mixed through mashed potato – although don’t use too much, you simply want to add a bit of flavour to an otherwise uninspiring plate of potatoes! Check out part 2 of our cheese taste test here.